Good day community and welcome to the first installment of my pre-preseason analysis of traded players. I don’t know about you but I have to admit I really like this free agency business. I’m sure if you love your footy as much as I do, you’ll agree that another month of footy related headlines isn’t a bad thing. It also keeps me busy and over the next few weeks I’ll be giving you my insight into some of the players that have moved clubs during this trade period. And what better place to start than the massive headline grabbing trade of this trade period thus far, Lance Franklin’s move to Sydney Swans. Hands up who called this one? Didn’t think so! Now most of you probably know that Franklin didn’t have the greatest of seasons in 2013. A lot of you will probably know this the hard way as Franklin was one of the most popular players in 2013 finding his way into over 50% of teams at one stage of the season. However a lot of us stayed away, as we drew comparisons with the Travis Cloke scenario in 2012. Cloke’s average dropped off in 2012 as speculation mounted over his future with Collingwood. For those of us who saw the parallels with Franklin’s situation last year we were proved correct, as the same thing happened again with Franklin’s average going south under intense media scrutiny over his future. The one major difference between Cloke and Franklin is that while Cloke chose to stay, Franklin has taken the cash on offer elsewhere and moved on. So where does this leave us going into Supercoach 2014? I’m sure many of you will be thinking.. Franklin at a new club, and a pretty handy one at that, with a spring in his step will bounce back to his old ways again in 2014. The added bonus being that he will be priced at a very attractive starting price of around $465,000 Supercoach and you’d have to think he will be a lock for most. But are we correct to think this way or are we getting sucked in, AGAIN? We all know what Franklin is capable of, as he has produced the goods in the past. 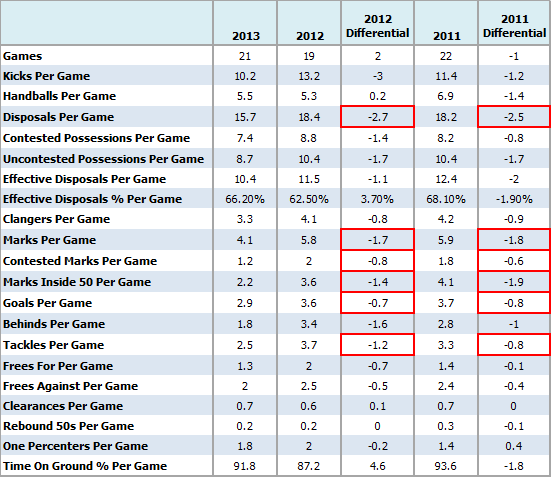 The table below shows Franklin’s Supercoach performances over the last 5 seasons. As you can see you have to go all the way back to 2009 to find a year that was worse than last year for Franklin. Let’s dive a little deeper into the stats and see the reasons for Franklin’s poor SC form last year in comparison to his two previous years of 2012 and 2011. As you can see almost all of Franklin’s stats from 2013 are down on his previous two years, with the differentials in Franklin’s key AFL Supercoach scoring stats highlighted in red. In 2013, he picked up an average of 2.6 less disposals, 1.75 less marks per game, 0.7 less contested marks per game, 1.7 less marks inside 50 a game, 0.75 less goals a game and 1 less tackle a game over his last two years. It’s pretty easy to see how his average Supercoach score dropped by 25 points when you add up all those stats. The question remains why was he down so much on his previous two years? I don’t think there is one clear cut answer to this question but I can come up with a couple of possible reasons, both closely linked. Contract Distractions – Some might say this is a bit of a cop out excuse but the simple fact of the matter is that the speculation surrounding Lance’s future must have distracted him from his football. If you didn’t know where you would be working in 6 months’ time do you think you’d be giving 100% at your current workplace, knowing rival firms wanted to snap you up on a far more attractive salary? Have a think about that one. The stats don’t lie either and probably the greatest evidence that he wasn’t 100% in the game was the drop in his tackle numbers. It is one thing to have a drop off in disposals and you can make excuses for that, like the Hawks game plan changing slightly by not going to Franklin as much. However one stat you can’t make an excuse for is the tackle count. Amazingly this dropped by 1.2 tackles a game in 2013 compared to 2012 and that just proved to me that Franklin’s intensity and desire wasn’t all there. Hawthorn Preparing for Life After Buddy – It would be naive to think that Alistair Clarkson wasn’t preparing for the worst case scenario of Franklin leaving. Even if it was only a second thought to the main focus of winning a flag, it was still there and there is evidence to suggest the game plan had been tweaked when it came to how and who the Hawks went inside 50 to. Jarryd Roughead stats between 2013 and 2012 don’t actually change all that much apart from two key indicators. While his marks per game where roughly the same in both years at 4.5 and 4.6 marks a game respectively, his marks inside 50 increased by 1.1 per game from 1.8 to 2.9 per game. We also see a direct correlation between the increase of marks inside 50 and the Coleman winning year of 2.9 goals a game, an increase of 1.1 per game on his 2012 season. So while Franklin’s marks inside 50 went down 1.6 per game Roughead’s went up by 1.1 per game. Get from that what you want but I think it is fair to say the Hawks where preparing for life after Buddy. So because Franklin has now moved on, it can be assumed that there are no more distractions and he’ll be back to being the main focus of attack for his new club the Sydney Swans. Surely he will be back to his 110+ Supercoach average ways once more and at a bargain price at the start of the year we have got to lock him in as our first forward. Right? Whereas both the Swans and the Hawks are marvelous football clubs with great lists and have shared the flag over the last two years, there similarities stop there. Both play a completely different brand of football and to assume that you can lift one player from one club and plonk him straight into the other and that his output will remain the same is a very dangerous assumption to make. Let’s have a quick look at the differences between these two teams from last season. On contested possessions, Sydney ranked first in the competition with an average of 155.2 per game. Over 6 more per game than the next best in the competition and 13 more than the Hawks who were ranked 8th. The Swans also rank number one in the competition in the clearance department, with 42.1 per game. This is 3.8 more than the Hawks who with 38.3 a game are ranked 6th in the competition. The Swans also rank number one in the competition for tackles per game with 71.1 per game, compared to the Hawks who are ranked 8th with 64.5 per game. On the flip side the Hawks are number 2 in the competition when it comes to effective disposal efficiency with only North Melbourne with a better percentage. This compares to Sydney, who languish in 15th spot when it comes to disposal efficiency. The Hawks are also the best ball users when it comes to clangers. They had the fewest clangers of any other team last season, whereas the Swans ranked 6th for the average number of clangers per game. As you can see from the breakdown of the stats in the above table, the Swan’s are more of a contested footy team. They try to dominate in the middle, with high contested footy where winning the ball in close is paramount. The focus isn’t on the run and carry but just getting the ball forward and if it isn’t clean ball they will go about winning the contested footy at the next break down up the ground. The Hawks on the other hand are a possession based side that rely on quality ball use. They are more patient in their build up and kick and mark the ball a lot more. The emphasis is not about getting the ball forward quickly but instead finding a target with the ball first and foremost. So what does this mean for Franklin and what should be expect from him in a Sydney jumper next year? Well this is where it gets a little bit tricky. Sydney’s game plan isn’t going to change that much with the addition of Franklin. They are still going to be a contested footy team and it is Franklin who is going to have to adapt to the Sydney game style. He got 56.4% of his possessions uncontested over the last three years at the Hawks where he led up the ground to collect quality ball from the elite kicks of his Hawthorne team mates. This is not going to be the case at the Swans and unless he learns how to win more contested ball I don’t foresee Franklin averaging the 18+ disposals a game he produced in 2011 and 2012. Likewise the quality of ball coming inside 50 will be a lot different than what he was used to at the Hawks. The under pressure rushed kicks coming in from a contested breakdown will be a far cry from the slower more patient build ups from the Hawks. Franklin has never been renowned for his overhead marks, and I somehow doubt if that part of his game is going to change under new coaching at the Swans. I can’t imagine him taking a speccy over a pack from a wobbly Dan Hannebery clearance. That is more something you might expect from Kurt Tippet, which brings me into my next point. Just like at the Hawks last year there is no guarantee that Franklin will be the number 1 forward for Sydney next year. I suspect most teams will put there number one defender on Franklin but I actually expect Tippet to be a better or at least a more consistent performer, just like Roughead was for the Hawks this year. Tippet is far more likely to win the contested ball at full forward, and while Franklin occupies the number one defender up the ground I won’t be surprised if Sydney kicks to an isolated Tippet one on one in the square, more often than going to Franklin on the 50m arc. With this rationale I also don’t see him averaging over 3 goals a game like he did in 2011 and 2012. The one stat I do see improving on last year is his tackle count as Sydney are just ferocious in this category and it won’t take Franklin long to join in. I wouldn’t be surprised if he improved on his average of 3.7 a game in 2012 and push close to the 4 a game total in 2014. However I’m afraid that this is the only stat I can see Franklin improving on from his best Supercaoch year of 2012 and hence why I don’t think we will be seeing his average sore back up to the 110+ that he produced that year. Franklin is a class act and I am sure he will have games where he absolutely dominates for the Swans and pumps out Monster 120+ SC scores; however just like last year with the Hawks I expect we will see many sub 70 scores. He produced 6 scores under 70 last year and only 2 scores above 120. He is a key position player and you will have to expect his scores to go up and down like his price all year. He might look an attractive price to start the year but I suspect you will see him at a lower price during the year. It is obviously very early days for Franklin at the Swans and we have to see how he gets through a preseason, how he fits into the Swans structure and how he performs in some pre-season games before any definitive answers can be made. However my early pre-preseason analysis suggests that Franklin isn’t the “Lock” many might have thought he would be. Expect a more analysis before round one but for now he is on the Watchlist and no more. Great to see you back again, Mick. I certainly look forward to getting a full pre-seasons worths of your articles for next year! I don't mind this free agency business myself either (now that the Crows signed Eddie Betts that is), but I wish they wouldn't let the FA period overlap with the trade period as half the bloody teams are seemingly sitting on their hands until the compensation picks are announced so everyone knows what number lotto ball they'll be playing with. It will be interesting to see how Franklin goes in a forward line with Tippett. Tippo certainly isn't as smart of a player as Roughead (or Gunston) and when he came back into the Sydney side they seemed to suffer a bit of the same syndrome Adelaide had with him, which is essentially bomb it into 50 and hope he takes a contested mark (which he is one of the best at in the AFL). But also as you pointed out, this could be a terrific boon for Tippett in SC because if Franklin is dragging the #1 defender out of the forward line, that leaves all the more room for Tippett to operate in. Anyway, at this stage I will not have Franklin in my initial side. Will be more than willing to re-evaluate that during the pre-season, and I think at the very worst he may be the same as this year where people saw him as a cheap upgrade target for their forward line (where he ranked #19th in the FWD position). Something to think about with Franklin is his time on the park. This is the biggest concern for me. He may well score 110 points per game next year but whats the bloody point if its over 16 games and he manages to miss the SC finals series again? Fellas, take from this what you will….only two years has he played 20 or more games and NEVER has he played a full season. One of the key resons I have consistently stayed away from him. I think I only had him one year, and he got suspended the week I brought him in. So great to have you boys back! Hey Jock, Mick and gang. Great to be reading an article again. Any thoughts as to making the top shelf articles for subscribers only? I would be happy to pay a subscription. Your stuff is better than SC Gold and surely you deserve a quid for all of your hard earned. Also, it will keep some of the tips secret. Last year my league were all over your trades Jock. Make the buggers pay for it. Great to have you back Peanutz – It's an interesting point you make – we do try and put out the best quality analysis of any one out there and I'm glad we have people like you who appreciate our efforts. Totally disagree. Its a community, not a website just looking to take our money. They receive money from advertising and donations anyway. You're a good man Eli – I've never considered myself a God. I've often thought of myself as a Moses type figure leading his people to Supercoach and AFL Fantasy enlightenment though, parting the seas of fantasy uncertainty. Interesting read thanks. Buddy is a star and will be in my team again. It would be great if the rolling lockout was scrapped. Some of us older SuperCoach players have other things to do over a footy weekend than check the ins and outs. Dreamteam is growing and the numbers are decreasing in supercoach and this may be the main reason. Throwing him straight in Peter ? What do you fancy he will average this year ?? I know this is quite late, but YES the HS is a total rip off. Go to http://www.news.com.au/sport/afl. Its the exact same as the HS website but for free. Nice read old fella…. Just Wondering What Starting Price Do You Believe Arron Sandilands Will Be? Aaron Sandilands? Is he still playing? I remember him back in the good 'ol dayz……. lockity-lock-lock. next years berger value meal……Sandiballs with a side order of nic nat into dean coxs up forward for some ruck forward DPP action. Sometimes Jock, you just have to say, stuff the consequences…..the benefits are just too big. Take the punt. he will deliver the Goodes, I'm Shaw he will Rampe it up and Bolton in. hey tom. Nice work. You in drouin? I live in drouin now just didn't want to give up my handle. May need to catch up for a beer. Sounds like a plan. You ever seen a bloke cleaning windows round town? Any luck stalking the window cleaner? no sign of tom the window cleaner as yet. G'day Mick. Quick question mate, I know how my jock hates picking up these early round draft picks because of their price, but with rookie locks like Hogan, Martin and possibly Broomhead, maybe we could make an exception and pick someone like a Kelly or an Aish, or possibly even the big fella Tom Boyd, purely based on the fact that they look to be absolute guns. Thoughts mate? Top article Mick. I started Buddy in my side the last 3 years. He was pretty good for the first two but a big disappointment last year. He will be on my watchlist this year and will need some serious improvement to make my side. I think Waite is a lot better priced and has plenty of upside after a fairly lean trot last season. Keep up the good work as your insights helped my side lift 10,000 plus places overall last year. Thanks once again. I like Jarrad Waite, but you just can't count on the bloke to stay on the park. Since 2009 he's played 9, 15. 12, 11 and 12 games. He's seems to always get injured, or doing something stupid that sees the MRP rub him out for 2-3 games (and with his record he'll always cop it sweet from them too, just like Stevie J). At his best he's capable of being a 100 point scorer, but I don't trust him enough to pick him. Now because he may have a low starting price (350K? I'm sure Mick will know this) I could envision a slightly risky strategy where you pick him up in your initial side, hope he can play the first 7-8 games, make some good cash off him and then offload him when he inevitably gets injured or hit with a suspension. But then you also run the risk of him playing 2 games, and then having a consistent merry-go-round of injuries and suspensions. That's the usual mid-price risk that you play though and not something you'd probably think about if you take the guns 'n rookies approach to SC. just too high risk blueprime…..you just cant rely on more than 16 games a year and no more than 6 of them 100+. no on waite for me. With his injury discount, big tex walker will be only a little dearer than waite and will be a much better option. Thanks for the comment, Jimbo. Mick agrees with you. I am a slow learner, but always willing to learn. Thank you for your comments, Marc. I will steer clear of waite and will look around for safer options. Thanks mate. Waite will be approx 390k – has upside but will never ever, I mean NEVER be in my side – Just far too risky and there is safer bets out there that are likely to pay out a lot more. Walker is looking like he won't get a preseason in so he might not even be ready round 1 – risky putting him in on his comeback too, without a full preseason to gauge where he is at. Whoops. That is a good enough argument for me. Waite is now not even on my watchlist. Thanks, Mick. Keep up the good work. Does anybody think that Daniel Rich will come good next year? I listened to the powers that be before the beginning of this season (i.e.. the SC main man) that were saying he was the next ELITE. I got burnt, but I haven't forgotten his "so called" potential and was wondering whether he's still worth a position on the radar? Paul Chapman at Essendon worth a look if he is fwd or fwd/mid? hmmm good question….will depend on what price he comes in at. my first gut feeling is no but that's mainly because I will be taking a punt on daisy's fitness and I don't like carry for than one or two injury risk on a line. might be prepared to talk myself around on this though…..
played 6 games in regular season at 95.6 with 4 games over 100. one of those sub 100 games was a sub affected game I believe when he returned and score 65 in 40 minutes of footy (round 22 – Sydney). has averaged 100+ pretty much throughout his career…. probably wont get any discount for injury as he played 6 games. Figures look good but I just can't help thinking I can spend my half million dollars better? Still a no for me but a watchlist. Lance is close to a lock for mine, when you think, Cloke improved so much from 2012, I suppose Buddy will aswell. He could average 105-115.